2014 Toronto Home Show - a whirlwind weekend! In case you missed some of my Instagram and Facebook posts recently - Mango Reclaimed spent last weekend at the Toronto Fall Home Show. It was a whirl wind weekend full of time spent with some amazing retailers and inspirational people. Not to mention time spent learning from Marian, aka Miss Mustard Seed! Miss Mustard Seed and Mango Reclaimed! You already know that I LOVE Miss Mustard Seed's Milk paint, but do you know that I am also a huge fan of Marian herself? She is extremely talented, oozes inspiration and is just an all around lovely person. If you want to learn more about Miss Mustard Seed and her beautiful work, you can read all about her here. And if you want to read about her trip to Toronto, you can read about it here. And if you want to see her gorgeous house filled with milk painted items, you can see it here. Actually if you haven't seen her website or blog before, you should probably set some time aside, go grab yourself a cup of tea, and be prepared to spend some serious time getting inspired as she shows you how you can move mountains in your home. 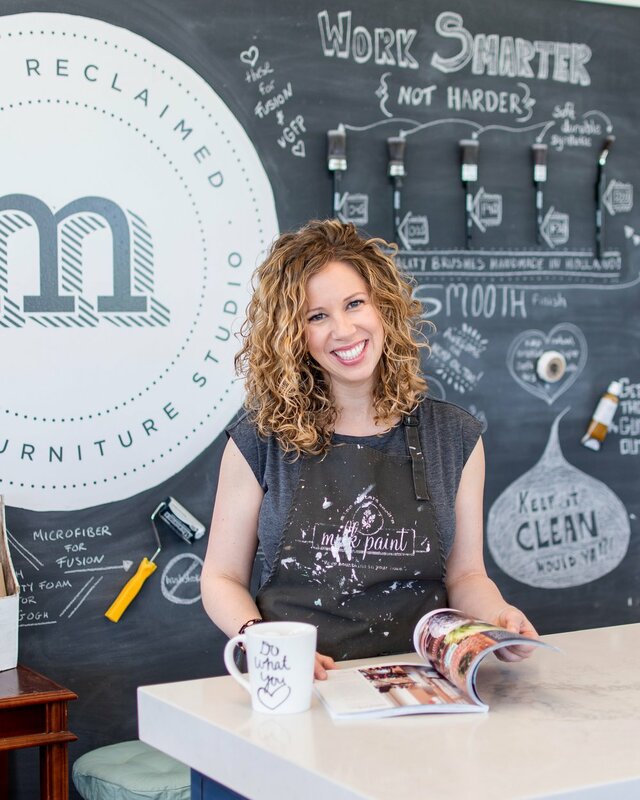 In addition to being on Canada AM, devoting her time to the Miss Mustard Seed Home Show booth, and presenting on the main stage everyday, Marian spent a full day with us lucky retailers giving us hands on advice and answering all of our questions. Speaking of Homestead House, did you know they also make Fusion Mineral Paint? I spent all day Friday with Jennylyn (below), the President of Homestead house learning about and playing with Fusion! Here's Jennylyn again with Marti Carroll from the Bayou Bungalow showing us the ropes. Marti has a great personality and kept us laughing all day as she inspired us with tips and tricks she has learned while being a professional decorative painter for over 23 years. So, after learning about Fusion Mineral Paint all day on Friday and extending my knowledge of Miss Mustard Seed's Milk Paint all day on Saturday. . . my sweet mom and I helped Jennylyn host a workshop at the Home Show on Sunday. We painted natural wood stools from ikea using Miss Mustard Seed's Milk paint and had a great time - didn't they turn out adorable?! I'll be adding this workshop to the lineup at Mango Reclaimed soon - so if you're interested check out our workshop schedule in the coming weeks. After this whirlwind weekend I am feeling thankful for all of the great opportunities this job offers me. I am inspired and excited for things to come in my little studio! Thank YOU for sharing my journey!